We’d love your help. Let us know what’s wrong with this preview of The Handmaid's Tale by Renée Nault. Offred is a Handmaid in the Republic of Gilead, where women are prohibited from holding jobs, reading, and forming friendships. She serves in the household of the Commander and his wife, and under the new social order she has only one purpose: once a month, she must lie on her back and pray that the Co Everything Handmaids wear is red: the colour of blood, which defines us. It seems to me that there is a concerning lack of representation in this book, considering the fact that the handmaid's tale is about issues which affect ALL women, the vast majority of the characters illustrated seem to be white...? Lucy Goodfellow The graphic novel follows Atwood's original novel. In the book, black people are banished and sent “back” to Africa, while Jews are sent to Israel.…moreThe graphic novel follows Atwood's original novel. In the book, black people are banished and sent “back” to Africa, while Jews are sent to Israel. The few black people who remain are postmenopausal women, known as Marthas, who perform domestic duties as maids and cooks. The TV show differs from the book by including women of colour so they can address the complications race in this specific dystopia. Can I read this instead of the actual novel? I would love to read the actual thing, but English is not my first language, so classics can be harder for me to read in English (plus they take me way too long to read) but I would consider reading this first and then watching the series.. Is that a good idea? Devon Munn L. wrote: "Good review but the show isn’t Netflix, it’s Hulu (at least in the US)"
I think it is on Netflix in some countries. Hulu is only available i L. wrote: "Good review but the show isn’t Netflix, it’s Hulu (at least in the US)"
David Schaafsma It is Hulu here and I changed it in the review, thanks. Stunning imagery. It's amazing how her vision matches how I pictured the setting to be in my own mind, almost exactly. Praise be. The classic Margaret Atwood cautionary tale has finally been adapted as a graphic novel, and it is perfection. The spare art style emphasizes color (especially red and blue) and the facial expressions convey much even when words aren't possible. I really can't say enough about the illustrations: they evoke even more haunting, chilling doom than words alone can achieve. I received an advance copy from the publisher via Netgalley for review consideration. The Handmaid’s Tale is one of my favorite classics of all time. I wrote a quick review for it the last time I read it in 2016 in preparation for the television show, so check that out for a more in-depth review. This review will focus on the adaptation of the story for a graphic novel and its illustrations. My biggest complaint with the adaptation is that it didn’t include my favorite quotes of the novel. “You can wet the rim of a glass and run your finger around the rim and it will make a sound. The Handmaid’s Tale is one of my favorite classics of all time. I wrote a quick review for it the last time I read it in 2016 in preparation for the television show, so check that out for a more in-depth review. This review will focus on the adaptation of the story for a graphic novel and its illustrations. “You can wet the rim of a glass and run your finger around the rim and it will make a sound. This is what I feel like: This sound of glass. I feel like the word shatter." There’s something about this quote that gets me every time. It’s visceral in its description and hard hitting in the emotion being conveyed. When I heard about the adaptation, I started imagining how this quote could be interpreted through images. Unfortunately, it wasn’t included. Though, the quote before it about being buttered is included so that kind of makes up for it. Everything else about the adaptation is executed flawlessly. The illustrations are gorgeous! I’m usually a fan of more clean cut illustrations, but these have a slight sketch component to them. They fit the story well while also communicating the more subtle moments of the novel. Overall, everything about this adaptation is incredible. I’d definitely recommend it. The art here is fabulous and the style certainly fits the tone of the book, but I think anyone without familiarity of the novel would be lost on how the story plays out and even more frustrating is the lack of representation. Atwood and the folks behind the television series have rightly been criticized for how white the book is and even with that knowledge prior to the creation of the graphic novel....there are hardly any faces of color throughout. My first exposure to the story in any form and I was blown away and can't stop thinking about it. Now I am eager to read the original and watch the show! Fantastic graphic adaptation of Margaret Atwood’s classic novel. Praise be. This was most excellently done. The United States government has been overthrown by a totalitarian religious regime. Women, the LGBTQ community, ethnic minorities, scientists, and many others become extremely oppressed. A woman now known as Offred is a Handmaid, a woman valued only for her fertility. She works for the Commander and his Wife. She does the shopping, some chores, and once a month, she takes place in the Ceremony, where she lies with the Commander in hopes of conceiving a child. But Offred remembers the times befo The United States government has been overthrown by a totalitarian religious regime. Women, the LGBTQ community, ethnic minorities, scientists, and many others become extremely oppressed. A woman now known as Offred is a Handmaid, a woman valued only for her fertility. She works for the Commander and his Wife. She does the shopping, some chores, and once a month, she takes place in the Ceremony, where she lies with the Commander in hopes of conceiving a child. But Offred remembers the times before. When she had a job, money, a child of her own. These memories could get her taken away by the Eyes, but she does not forget. As she wills herself to continue through her life in Gilead, we learn pieces of her story as she conveys terror, dread, oppression, and hope in this new world. I imagine many people know the basic story told in the Handmaid's Tale. I did, even though I have not read the original. I was supposed to in high school but eh, high school. I thought maybe this graphic adaption would be a little easier to digest. And it was, in a way, but it was also haunting in its own right. Nault's illustrations really hit home because, aside from the attire that the women wear, everything looks so damn familiar. The settings, the buildings, the men and people in general. It could be here, now, anywhere. And it is. The illustrations, to me, bring the story to the present in a way the original would have wanted. It speaks of how quickly the world can change, if we let it. Beautifully done. I've never watched the Netflix or read the book so this blew me away. Beautiful and faithful rendition of the original novel. It was amazing to me that the illustrations showed scenes as I had imagined them in my mind when I read the novel! I think the art is absolutely beautiful, though I do agree with one question posed on the book's page—there is a stunning lack of representation... I think there is one black character throughout the whole graphic novel? 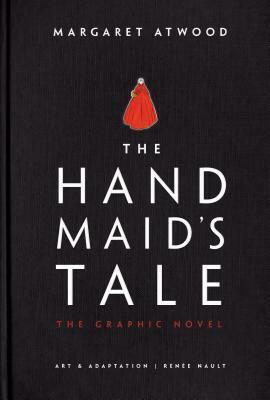 Even so, I still really enjoyed reading this—I think The Handmaid's Tale adapts nicely to the graphic novel format. If you're ever looking for a shorter, quick version of the book, this is definitely a good option. I finished this ebook quickly! I haven't read the text-only version, so I can't say what is different, what is missing, what is new. But it's damn good. Just beautiful and perfect. I already own two copies of the novel and I was interested when I saw this was coming out but when I came across it in the flesh it wowed me. I practically ran to the till to buy it. The art and the adaptation are flawless. The illustrations complement the words so perfectly, with clever and creative little flairs that are just like Atwood's writing. I devoured this in a couple of evenings but I know I'll be enjoying it again and again for years to come. What a beautifu Just beautiful and perfect. I already own two copies of the novel and I was interested when I saw this was coming out but when I came across it in the flesh it wowed me. I practically ran to the till to buy it. I have read The Handmaids Tale and really enjoyed it. I absolutely love the show, so when I saw that there was a graphic novel I needed to read it. This was a great addition to this universe and I highly recommend it. I will say that I recommend that you read the book first because even though this was a great graphic novel, there was obviously a lot missing. How do you even rate rage? I picked up this book last night - and then read it all in a single sitting. Completely worth it. I first read the novel in high school back in the 90’s, and I still own that copy. It’s a story that sticks with you - gets its claws into you and doesn’t let go. The graphic novel is a faithful representation of the source material, and it doesn’t pull any punches. Like the show, actually seeing it all laid out makes it sink in more and triggers a powerful emotional response. Nault’s artwork is stu I picked up this book last night - and then read it all in a single sitting. Completely worth it. The drawings evoke a range of emotion, beautifully done. It was shorter than I anticipated - quick read! First graphic novel I've read, so wasn't sure what to expect. Very pleasant surprise. It's frankly hard to imagine how a better graphic novel adaptation could have possibly been pulled off. The artwork Renee Nault bring this masterwork of dystopian fiction alive in ways that easily rivals anyone's imagination, and now Margaret Atwood's tale is even more accessible than ever in a time where it has become all too relevant. This was a tough one for me. The Handmaid's Tale is one of my favorite books of all time and I am a huge graphic novel reader. However, I didn't feel like the graphic format added anything substantial to Atwood's story. The majority of The Handmaid's Tale is Offred's inner monologue, which doesn't lend itself well to visual storytelling. The result was Renee Nault inserting larger sections of text at the beginning or ending of chapters, causing some disconnect between art and text. I didn't pers This was a tough one for me. The Handmaid's Tale is one of my favorite books of all time and I am a huge graphic novel reader. However, I didn't feel like the graphic format added anything substantial to Atwood's story. Whitney Erin wrote: "Oh, that’s disappointing." Don't misunderstand the 3 star rating. This was an excellent graphic rendering of Atwood's now classic dystopian tale; it's just horribly frightening and realistic in these contentious times. When I read current news accounts of women's rights being gradually suppressed (or trying to be), I feel great distress. This is an important book but also a scary one. The art and use of color is gorgeous. I think this works more as a companion than an adaptation, however. The art is stunning, but so much of the story is lost in translation. Also, white as hell. Darla In the book, it is mentioned that POC are banished in Gilead and Jews were sent back to Israel. Gilead itself is a white, Christian nation. Clementine Darla wrote: "In the book, it is mentioned that POC are banished in Gilead and Jews were sent back to Israel. Gilead itself is a white, Christian nati Darla wrote: "In the book, it is mentioned that POC are banished in Gilead and Jews were sent back to Israel. Gilead itself is a white, Christian nation." Renee Nault is a Canadian artist, illustrator, and graphic novelist. She is known for her vivid watercolor and ink illustrations.